'Muffled' Alerts, Personal Calls: Report On White House Fence Jumper : The Two-Way One Secret Service officer was on his cellphone when a man jumped the fence and made his way into the mansion in September. A review finds gaps in communication and training in the security response. 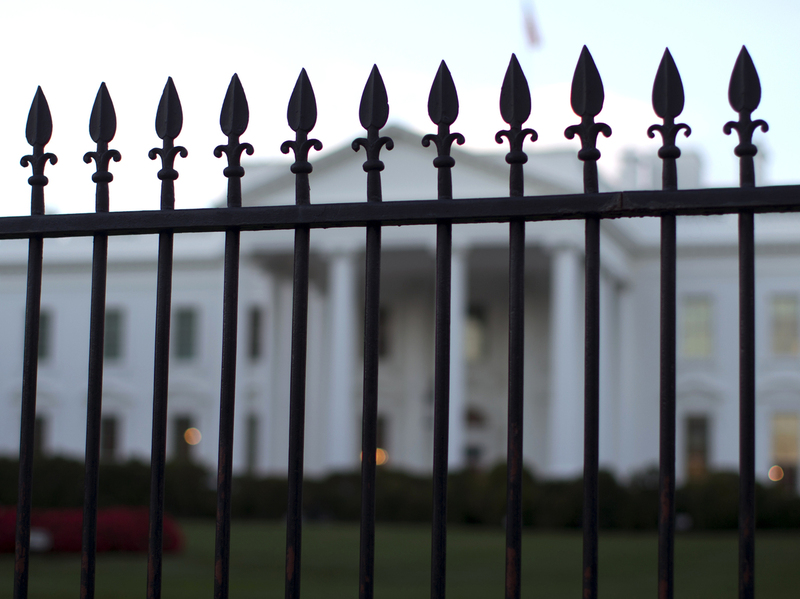 An intruder managed to jump the north fence of the White House on Sept. 19 and escape capture until he was inside the mansion. A review of the incident cites communication and training failures. Secret Service communication failure and gaps in training allowed a man to jump the White House fence and run into the mansion on Sept. 19, a review of the incident finds. On Sept. 19, four officers spotted Omar Gonzalez before he made it over the fence around 7:20 p.m, the report says. He ignored their verbal commands as he prepared to climb part of the fence where an "ornamental spike" was missing on top. Construction around the White House obstructed other officers' views. Once Gonzalez made it onto the grounds, two officers followed him with rifles, "but determined that lethal force was inappropriate because Gonzalez did not appear to be armed." Radio transmissions were reported by some other officers as "unintelligible" or "muffled." The doors to the White House were unlocked, so Gonzalez just pushed his way past an officer inside. Ultimately, two agents who had just completed their shifts — and were on a lower floor — ran to the scene and helped bring Gonzalez down. Emergency Response Team members outside the North Portico "did not immediately enter the Mansion. They were unfamiliar with the layout of the White House, and waited to assemble into a tactical formation before entering the North Portico door. By the time they entered, Gonzalez had already been subdued." In summary, the review says, training was a problem. There hasn't been enough of it "due to staffing shortfalls" and the training the officers did have apparently did not prepare them for "non-lethal force scenarios." Poor communication resulted from "a combination of technical missteps, lack of radio discipline, improper use of equipment and aging infrastructure," it says. The report also notes that Gonzalez had been stopped and searched three times over the summer, but officers lack a "one stop" database that would have shown them his full background. NPR's Brian Naylor adds that this review "is part of a larger look at recent episodes involving the agency, which led Secret Service director Julia Pierson to step down."